For a few people, age is just a number; that is what one would consider seeing 101 year old Verdun Hayes from Somerset. We barely can dream to live up to 100 years, but this gentleman’s story is beyond imagination!! Verdun, a World War II veteran, who fought on the beaches of Normandy in 1944, has enlisted his name on the Guinness World Records’ as world’s oldest ever skydiver, at the age of 101 and 37 days. 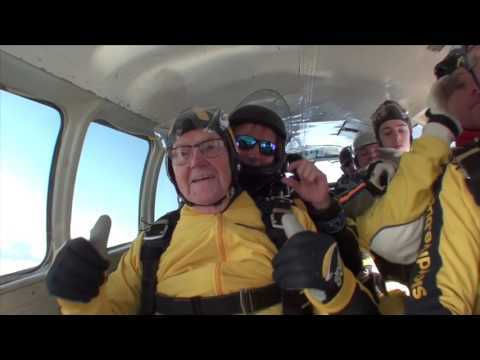 Verdun made his debut skydive last year to celebrate his 100th birthday. Not that it all went completely smooth; he felt no nerves on his debut dive. Verdun has previously flown gliders, been a county champion runner and even survived a small hot air balloon accident in his eighties. I thought to myself, ‘This is queer, I can’t see anything‘. It didn’t dawn on me for a while until I realized we were in a cloud! After we’d got through the clouds I could see all of Wales and the entire coast. It was so beautiful, said Verdun Hayes. Verdun credits his long life to his late wife Hilda, who died six years ago at the age of 95. They were married for 76 years from the age of 21. We had a perfect marriage and she was a wonderful cook. We loved one another, did everything together and went on holiday all over. If I had to pick a wife again I could never pick a better one. Verdun fought in the Second World War. He was called up in 1942 and landed on in Normandy as part of Operation Overlord. He made an emotional pilgrimage back there last year to stand and salute his friends in the Royal Signals who didn’t come home. ‘Just keep breathing’ is the mantra Verdun gives to the people who ask him how he has lived so long. The spirit of Verdun Hayes is truly amazing and indeed inspiring; hope he sets more milestones in the days to come. Verdun Hayes Tandem World Record at 101 Years and 38 Days Young!